Things are not going well for my poor ol’ stray, Latte. A few days ago, knowing that a good friend – Hi Ben! – was coming by, I put Latte’s food dish deeper into the cubby I’d made for him out of a cage, and closed the door after him when he went inside. He made no fuss about the situation at all, not even when we hoisted the cage up and carried it to my car, then closed him inside and drove him all the way into Hobart. He was curious, but otherwise unperturbed by the whole affair. He was even incredibly chill about being transferred from the carry crate I’d tucked into the cage for him (somewhere he could hide and feel safe) and into the enclosure at the Hobart Cat Centre. I thought everything was going so well. He seemed entirely comfortable with everything, aside from a few hisses at new faces – a clue I probably should have caught at the time. He was (and still is) frighteningly emaciated, and his squinting eyes made me fear for his health. I hoped the HCC would have the facilities to clean him up, desex him, vaccinate him, microchip him, rehabilitate him, and find him a new home. When Ben and I brought him in, I gave him as much of his history as I could, from a little under two weeks of knowing him, alerting them that I’d never tried to pick him up, that he’s a ‘conversational hisser’, and desperately in need of TLC. I have no experience rehabilitating cats. Monster had some major surgeries in his lifetime, and I recall dealing with tubes for drainage between bouts of nausea from just looking at it, but that was very straight-forward. I have two other cats I really don’t want exposed to anything Latte might have had – I thought Feline Chlamydophila (or kitty clap, I guess) – and nowhere to adequately quarantine him. However, when I dropped him off, it was impossible to not recognise and acknowledge that Latte was not an ideal case, and it was at best 40:60 against him being a fit candidate for rehoming. I spent the ensuing day and a bit feeling wretched with worry for him, but I’d put in a special request that someone contact me if the worst should happen. Today, I got the call to let me know that the worst had, in fact, happened. He’d been very aggressive with the vet who’d picked him up – possibly without being cautioned – and given his retained testicle and cat flu, was too challenging a case for the HCC. If I didn’t collect him today, he would be put to sleep. 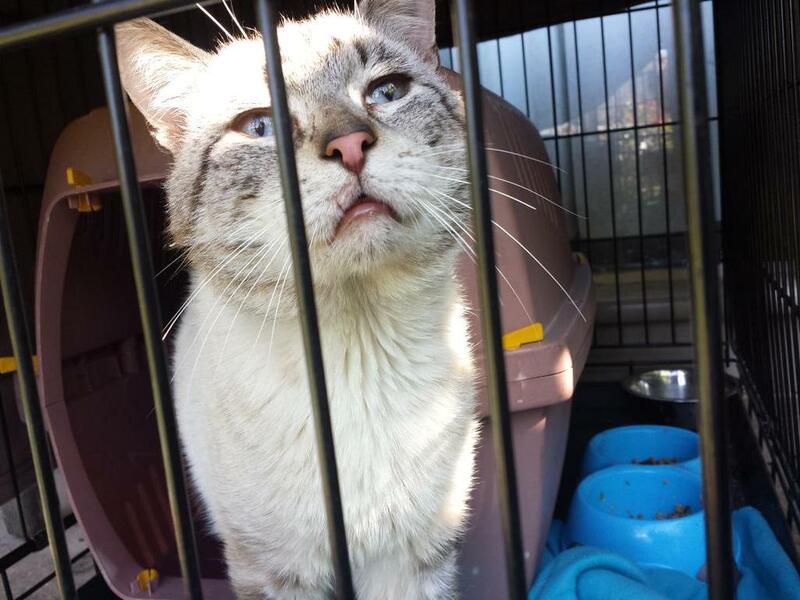 Now, before anyone gets all cranky with the Hobart Cat Centre, understand that had he been capable of being rehomed, he would have been there until he found his new home, without any danger of being put down after some arbitrary length of time. They are a not-for-profit organisation, run by volunteers, with lots of cats and kittens (especially at this time of year! ), and these choices, though difficult, have to be made. Their resources are scarce, their space for quarantining a potentially aggressive tom even scarcer, and the cost of fishing out a retained testicle almost certainly beyond their meagre budget. So, I activated my phone tree. Okay, I admit it, I have so few local friends it was more like activating a phone weed, but my weeds… I mean friends… are awesome! Ben came through for us again, and Latte is now back with me – for better or for worse. Realistically, it’s almost certainly for worse, but not for worst. A year ago I lost my cat, Monster. Six months ago I lost my dear friend, Spirit. Sure, I’ve known Latte less than two weeks, but I’m the sort of sap who invests 110% emotionally into an animal, and I couldn’t stand the idea of Latte being put to sleep, just another unknown, unloved stray cat. When Ben arrived and I went to fetch the carrier, Latte seemed to be looking for me from the sound of my voice. I’m probably imagining it, but I admit I was a little heartened to see his pink nose and blue eyes fasten to me. He was probably just recognising the smells in my backyard. So, I’ve saturated the area around the crate with some stuff that’s supposed to discourage territory marking by neutralising other cat smells – I so wish I’d thought of this before he arrived, but I was too busy turning circles on the spot and asking myself wtf I’m doing. I expect I’ll be doing a lot of laundry in the near future. We have an appointment with my local vet on Tuesday – almost a whole week, but can’t be helped with this pesky Christmas thing happening at the moment. My vets are awesome, and I’m going to be right there to make sure Latte is as calm as he can be, and the vet is as prepared as they can be for dealing with Latte. Somehow, I’m going to have to get him treated for everything, vaccinated for everything, and get them to go in and find his retained testicle, a surgery I expect is a good deal more expensive than the usual ‘nip and tuck’. He’s shown no aggression to other cats, which is great. But that lack of aggression could be lethargy from cat flu. EnormousCat is also a former stray with the tell-tale box head of a tom desexed way too late. He does occasionally spray when a cat he doesn’t like turns up close to our front door. He’s been absolutely wonderful with Smudge, but Smudge was just a kitten. I have deep and grave reservations about how he’ll respond to Latte. So far he’s just been curious, no hissing, no hackles, no growls, but they’ve always had screens or windows between them. And even if the cats do get along, I am so not in a position to take on a third cat. Especially not when I’d really like to adopt a dog soon. Perhaps, once he’s fixed and more socialised, I can take him back to the HCC for another attempt to rehome him. That cat is so lucky to have you looking out for him. I hope the vet visit next week goes well and that you have some good news for him soon. I’m such a spineless sap. I hope word doesn’t get out among the local strays!